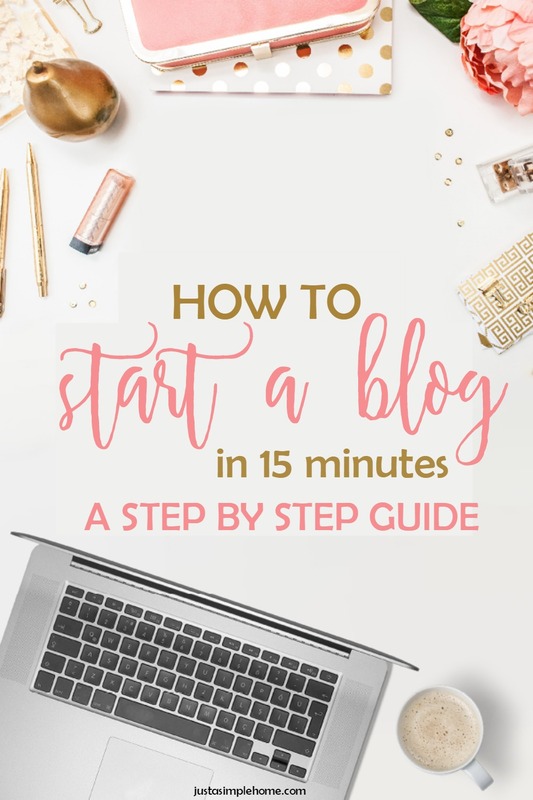 I have had sooo many ladies reach out to me with questions about starting a blog that I figured I would write a step by step post for you. 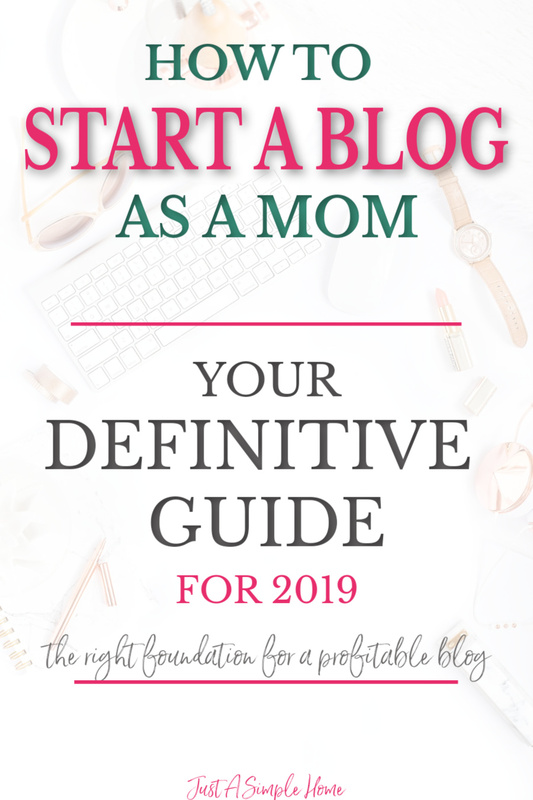 So, if you have wanted to start a blog for moms for awhile or are just now thinking about it, now is the time! It seems like a lot of information, but it is only because I am breaking it down for you in steps. Follow the steps and you will have your blog set up in no time! 1) SELECT A DOMAIN NAME AND GET IT REGISTERED. Domain name is a fancy term for your website address. My domain URL is www.justasimplehome.com. You’ll want to do some research before you choose a name for your blog. You want something that fits you, what you write about, and is unique and will help you stand out in a positive way. Think for awhile, but don’t overthink. Think about a name that reflects you, and allows for some creative flexibility in the future. While I mostly write about being a mom and homeschooling, my domain name is broad enough that I can write about a variety of topics. Once you have decided on your name, you need to register it so it belongs to you. Since you are just starting out, I recommend registering your domain name where you purchase your hosting package. This will simplify everything for you. We will talk about hosting next. 2) DECIDE WHICH HOSTING PROVIDER TO USE. If your domain name is like your address, your host provider is like your house. You want to pick a trustworthy host because if they have problems, you have problems. Your host is where your blog “lives,” so it affects your site speed and accessibility. Support is also an important factor to consider when choosing a host. You want to be able to call when an issue arises and have it fixed right away to avoid blog downtime as much as possible. If you’re just getting started and want an amazing combination of price, speed, and reliability, I recommend Bluehost. It’s a big company and I have had a great experience with Bluehost. 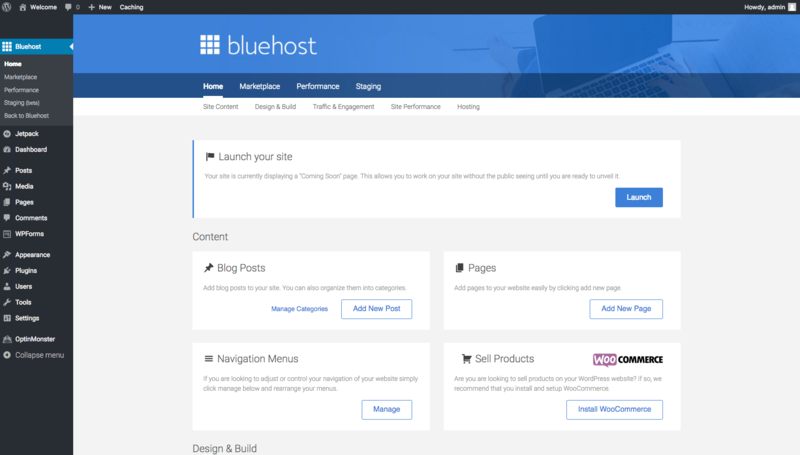 We will go over getting started with Bluehost, step by step. 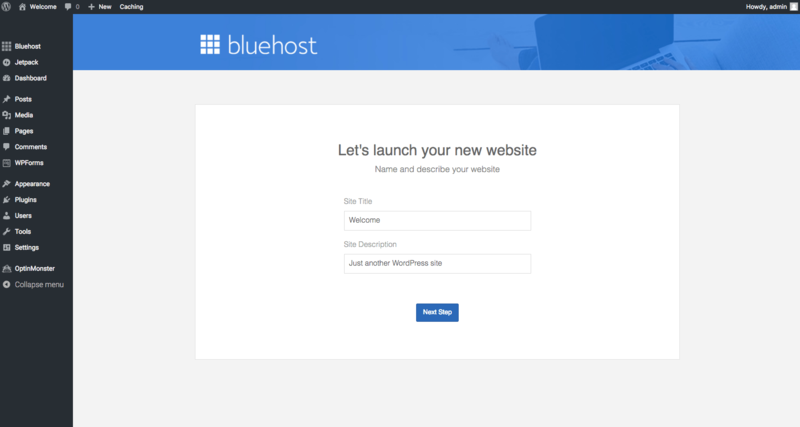 Ok, now I am going to walk you through the steps of getting started with Bluehost. It seems intimidating at first, I know. But the steps are broken down in sequential order, with pictures, so I know you can handle it. 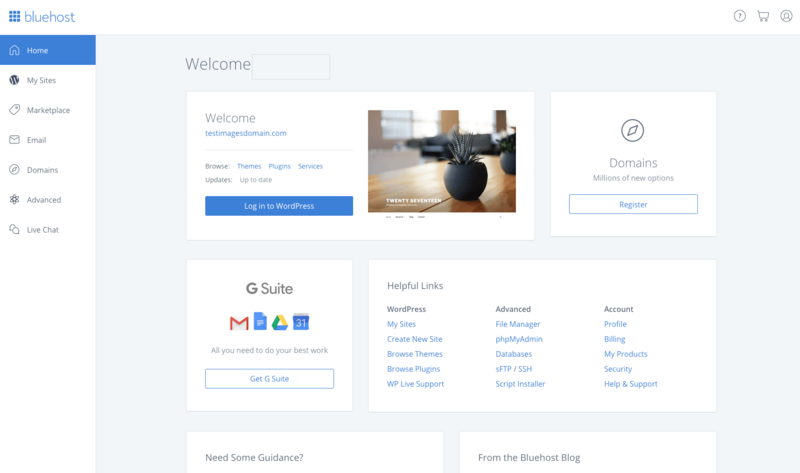 1) Navigate to Bluehost. You’ll be re-directed through my affiliate link and you may get a few additional perks for signing up through my code. (Thank you for your support!) Click the big green “Get Started Now” button. 4) Continue down to the “package information” section. You get the cheapest monthly rate by selecting 36 months. It’s important to note that Bluehost charges you for the full the 36 months upfront. You are prepaying for the hosting. That’s one of the reasons they are able to offer great hosting at such a small price. They always have that money-back guarantee, though, so you won’t risk losing your money. This is your biggest expense for your blog and well worth it, so don’t worry! 6) And now you officially have a Bluehost account. Exciting, right? Next you need to create your password. 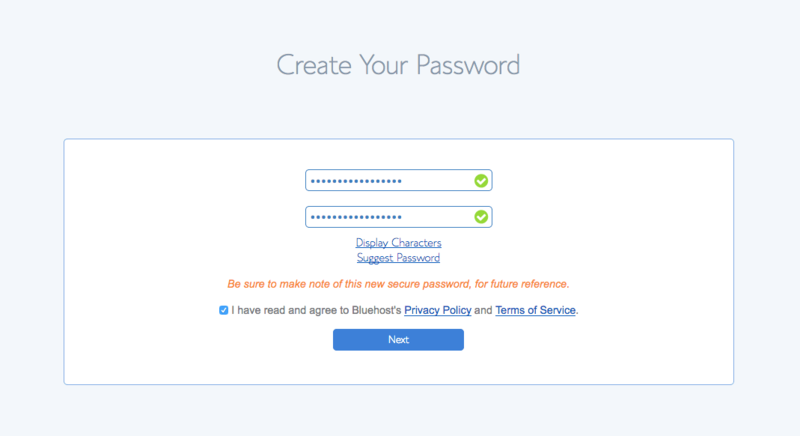 7) On this screen, you’ll create your Bluehost account password. Save this somewhere so you aren’t like me and have to reset it a million times. Trello is a great place to save important information! 9) When your account opens for the first time, you’ll have the option to choose a free theme. You can do this later if you’d like, so click “Skip This Step” below the offered themes. Now you’ll be in your account dashboard. You will get very familiar with this page. 11) Bluehost will then install WordPress for you. You will see this screen when it finishes up. When I started my blog, I had to install WordPress myself, so I think this is wonderful! 11) Go ahead and click the blue “Start Building” button. You will be brought to this screen. 12) This is where you will add the name of your site and your tagline. Don’t worry, you can change your tagline later if needed. 14) Fill out all the information on the next screen (Username, Email, etc) and be sure to change Role to “Administrator.” You do NOT want to keep the Username “Admin” as it is not as secure. 15) Click the “show password” button. Be sure to copy and paste and/or screenshot this and save it somewhere safe. You will need this password to log in to your WordPress site. You can always go back into your User Settings and change your password later. Once all the information is complete and you have your password, click the “Add New User” button at the bottom of your screen. 16) Now that you have your password, you can log into WordPress and you’ll be presented with your WordPress dashboard. If you see this first screen below, just go to the left and click “My Sites” and you’ll see your new site. That will take you to the dashboard. This will seem like a lot of information! Spend some time going through the various settings. It may be confusing at first, but in no time it will all be second nature. I am not a tech person, but I took to it quickly. You did it! Congratulations on choosing hosting, installing WordPress, and logging into your dashboard for the first time. Phew! You made it!!! Now you have your address and your home and are ready to go! Now for the fun part…you get to pick your theme! This is the visual aspect of your blog, how it looks when people visit your site. 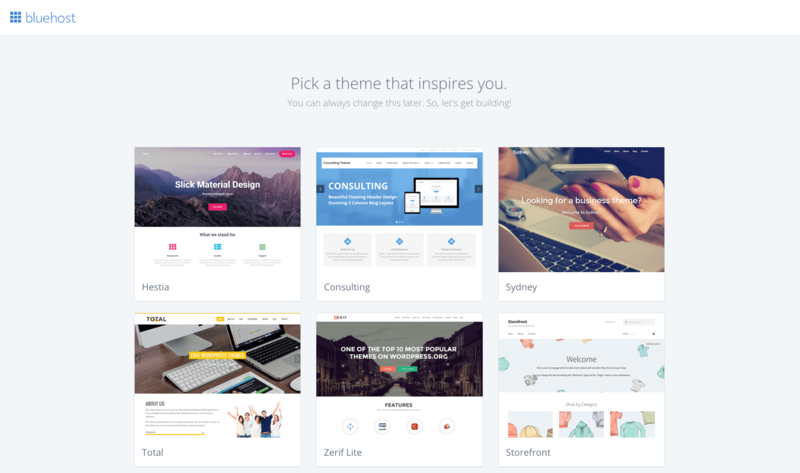 Your theme affects your background, colors, fonts, social media buttons and more. 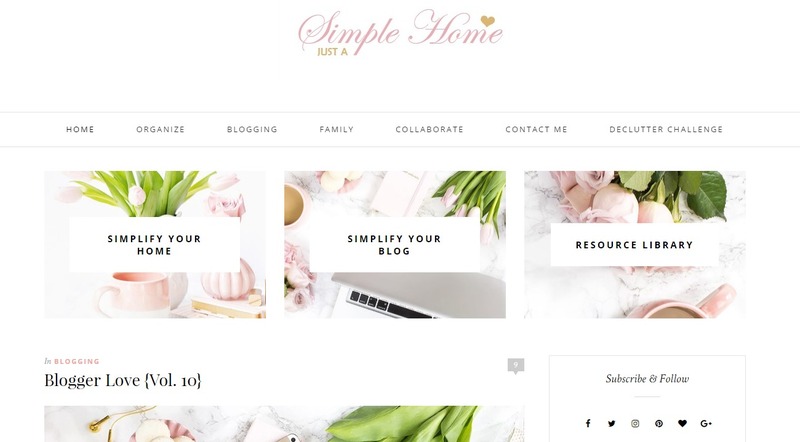 After a domain name and hosting, the next money you spend on your blogging journey should be on a custom WordPress theme. There are thousands of free WordPress themes out there; WordPress even comes with the official 2018 theme pre-installed. You can choose one of their free themes when setting up your site, if you wish. As soon as you can swing it financially, though, I recommend you start with a premium theme that looks great out of the box with minimal customization. You want your blog to stand out against the masses of blogs out there and having a theme customized to you will go a long way. In full disclosure, my husband is a web designer, but I wanted to do as much as I could by myself, so I went with a theme by Creative Market. They have many, many, themes to choose from and I have been very impressed with their customer service. I had a limited budget, so my theme was not crazy expensive. However, your theme is the decor of your blog, so I wouldn’t skimp here. I found a theme that I fell in love with, that had plenty of bells and whistles so I could change and expand as I wanted. I prefer a cleaner looking theme, with plenty of whitespace. If you decide not to go with a child theme from Creative Market, you can also check out child themes by Restored 316. They have beautiful, feminine style themes that I am just obsessed with. My husband frequently uses ThemeForest and ElegantThemes, so I am confident in recommending those companies as well. All of the themes I mentioned above come with excellent service and support, and they will be able to help you get set up in no time. If you ever have any questions about the technical side of setting up a blog, please ask away in the comments, and between my husband and I, we will help the best we can. Congratulations and happy blogging! Great post. Your steps and clear and easy to follow. What a great tutorial Terryn! I wish I had that when I started my blog since it would have made things so much easier!! If I had this three months ago, I would have saved myself a lot of tears! I wish I would have gone self hosted right away. You make it so simple on how to sign up and get started! Great post. I confess my hubby did the first part of your tutorial for me but the rest Ive done myself. I love how detailed your post is. It’s a bit of a random thought, but you really have such a beautiful layout to pair with this blog post! It’s hard not to think, “Yes! I will be successful” with such a brilliant example speaking in your favor. Great job! I know this is probably self explanatory but I am on a very tight budget , when they do the payment they don’t take the total amount out right away right? Its broken into monthly payments for totaling that amount? Hi Amanda! Sorry I am a few days late in answering…most of the time you do have to pay for the year of hosting upfront. They are having a sale right now where you can get your hosting for $2.95 a month though! I know how it is to be on a tight budget. When you start your blog, I would love you to join our group, Blogging With Heart! So beautiful posts. Your idea of a prayer journal is amazing. I love these blogging tips too. I currently dont have any money to switch to a paid version. Hopefully the Goddesses will help me with this. Thanks. Great post and a lot of helpful information. Thanks 🙂 On blogger you can earn money from ads, affilate and e-commerce it’s a big misconception that you can’t though. You can also change the domain name too.